Even champions need the occasional wake-up call. 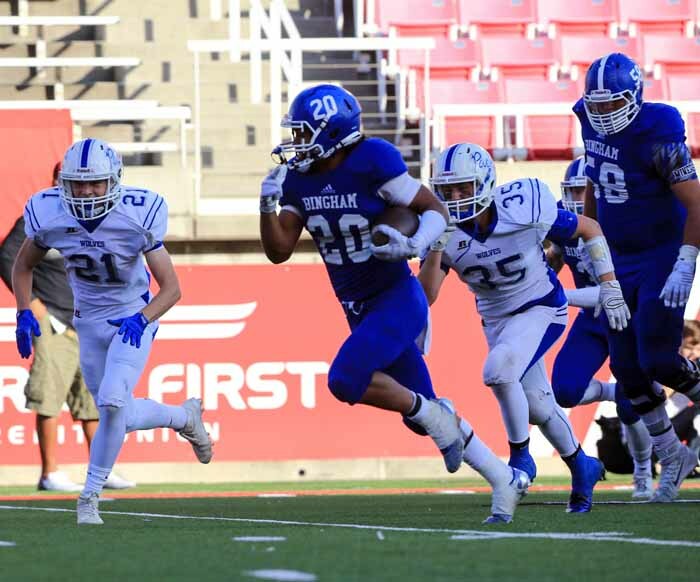 Such is the case for the Bingham High football team, which is used to spending the third Friday in November playing for state championships. A year ago, the Miners were rolling and appeared to be headed for another title when they ran into Lone Peak in a state semifinal matchup. Despite their undefeated status, the Knights were considered by many an underdog to the powerhouse from South Jordan. The Lone Peak defense hit the Miners hard and big plays, in particular a pair of long touchdown passes from Talmage Gunther to Jackson McChesney, took Bingham off its game. When the afternoon ended, the Knights had claimed a 26-9 win and the Miners’ season was over. Fast forward to Week 3 of the 2016 season, the rematch had a very different look. Bingham was on top of its game and the Miners rolled up 42 points on their way to an overwhelming 42-21 win. It’s the only blemish on Lone Peak’s season. As these two juggernaut’s prepare for one more battle Friday afternoon, this one for the state championship, Lambourne feels like there aren’t a lot of secrets left between the two teams. The one thing that is very apparent in the matchup is the athletic ability of the Lone Peak skill position players. When the Miners take the field, everyone pretty much knows what to expect, or do they? The perception that Bingham is going to run at you and grind it out in the ground game is true, but Lambourne takes particular pride in the efficiency of his team’s passing game over the years. So, what will Bingham bring to the party Friday afternoon? That’s something we’ll all have to wait and see. One of the things that looks a little different about this Bingham team is having a few players going both ways, on offense and defense. For many years, the Miners have been one of the few teams that has chosen not to platoon their players and it has been extremely successful. This season, some injuries at the running back position introduced a change in that area that has worked out well. While there has been the occasional player who has played on both sides of the ball, it has never happened with running backs, but Daniel Loua and Amoni Kaili have been so good, it’s been impossible to keep them off the field. Those two were the team’s leading rushers in the Miners’ semifinal win over Fremont, both going for over 100 yards while also playing defense. The nice thing for Lambourne is that he doesn’t have to substitute his backs situationally. He can pretty much ride the hot hand…or hot feet. “All those guys can run all of our schemes very well, there’s not one that can only do this and one that can only do that,” he said. “They’re all pretty versatile and their success, of course, has to be at least somewhat related to how the offensive line plays, how our blocking backs do, how well our receivers block. That’s really a team effort and I like it that way, not that we purposely went that way but I like the fact that guys are stepping up and are willing to sacrifice for each other and encourage each other. Lambourne credits his assistant coaches for having Loua and Kaili ready to go with both units, despite the fact that the two-way player is not the norm at Bingham. He says it has not hampered or even really changed, their game preparations. While it’s offense is certainly a highly effective unit for Bingham, these team still dominates because its defense is elite every single season. “I think our defensive coaches and their commitment to it has been terrific to start with. We seem to be able to come up with good players in all positions,” Lambourne said in describing the consistency of his defense from year to year. “The system promotes some of that, but you’ve got to give credit to the kids. They work hard, they study hard and then they play hard. 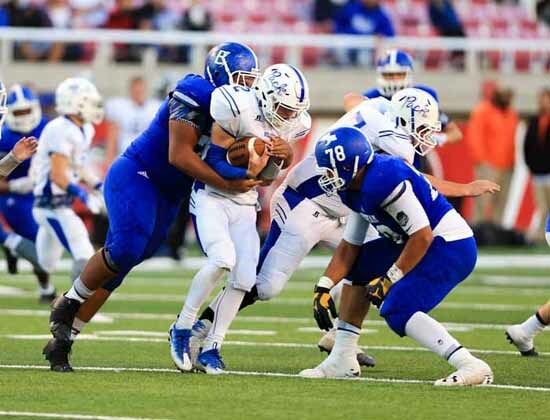 Bingham played most of the season without perhaps its most dominant defensive player, as defensive tackle Jay Tufele was recovering from injury. Now, he’s back and that means this group is at its best when the games are most important. Preparing for state title games is hardly new for the Miners, but Lambourne can’t state for certain the been-there, done-that nature of this week is an advantage to his team. He doesn’t have much with which he can compare it. 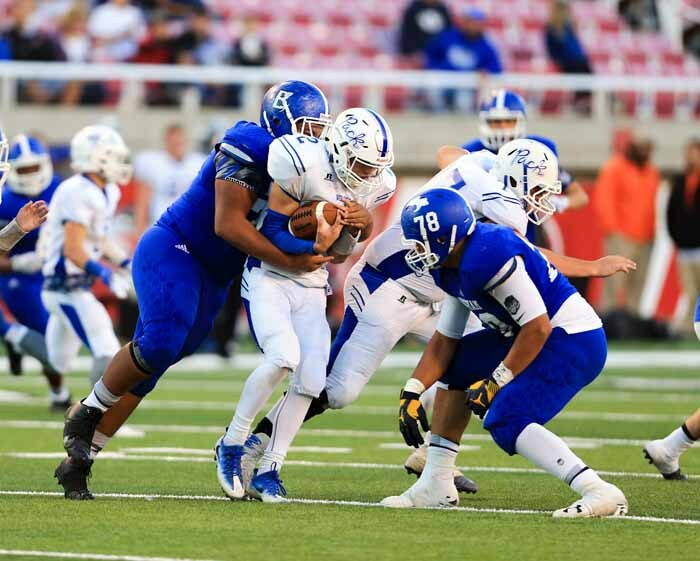 So what are the keys to a Bingham win over Lone Peak? Lambourne’s response to that is just what you might think it would be. He knows his team will have its hands full with Lone Peak, but not for the obvious reasons. 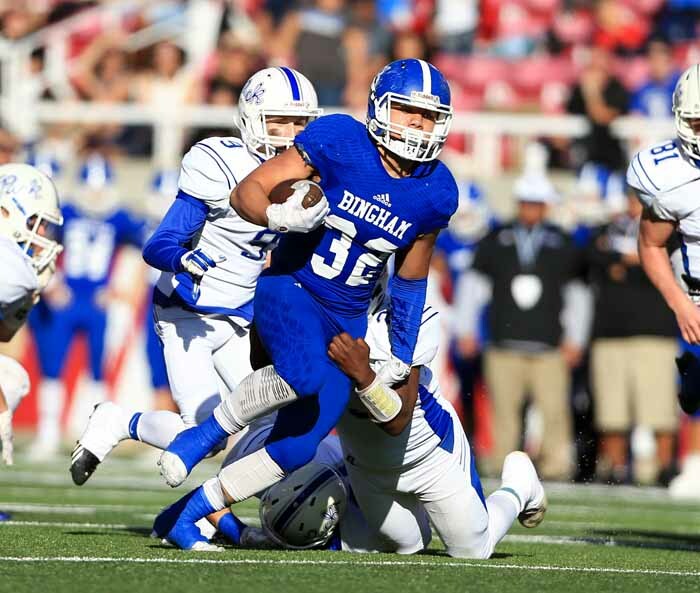 The Knights might be perceived as a big-play team, but Bingham’s coach knows better. He knows Bingham has to keep the Knights’ athletes in check, but it goes beyond that.